The day that I've been promising you for the past 4 or 5 years has finally arrived. 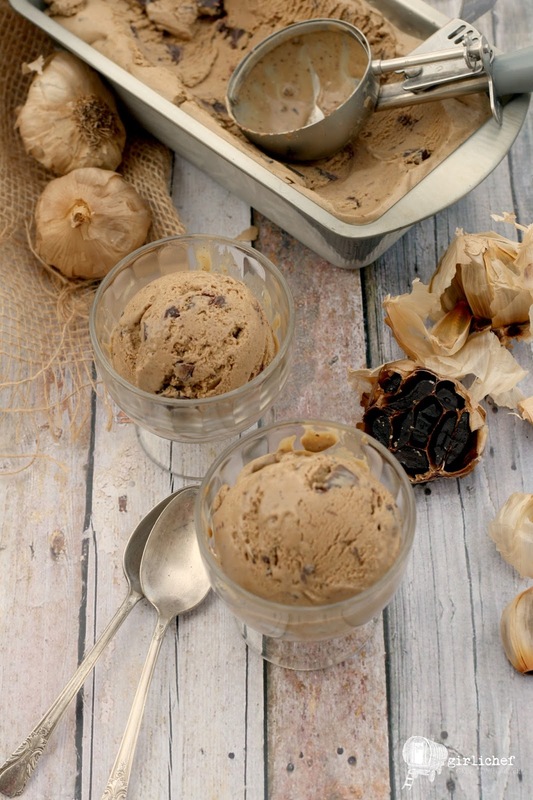 The day that I share with you a big bowl of GARLIC ICE CREAM! I've made a few garlicky desserts in my day. One that I've mentioned, but never actually shared with you, Pineapple-Garlic Upside Down Cake (imagine roasted garlic cloves in place of the maraschino cherries). And then couple of years ago, I shared an Apple Spice Cake with Roasted Garlic and Honey-Poached Garlic Sauce. I can't help it, I'm drawn to the unusual! But not only the unusual, as pretty much anything with garlic is good in my book. My old standby and perennial favorite is Chicken with 40 Cloves. Garlic Soup in pretty much any form is also something that I can't get enough of. One of my favorite treats is topping a round of Brie with as many roasted garlic cloves as I can fit on top, and then sliding it into a hot oven until the brie is soft. Give me that, a loaf of crusty bread, and a bottle of wine...good lawd, call it a day. Back to the ice cream. 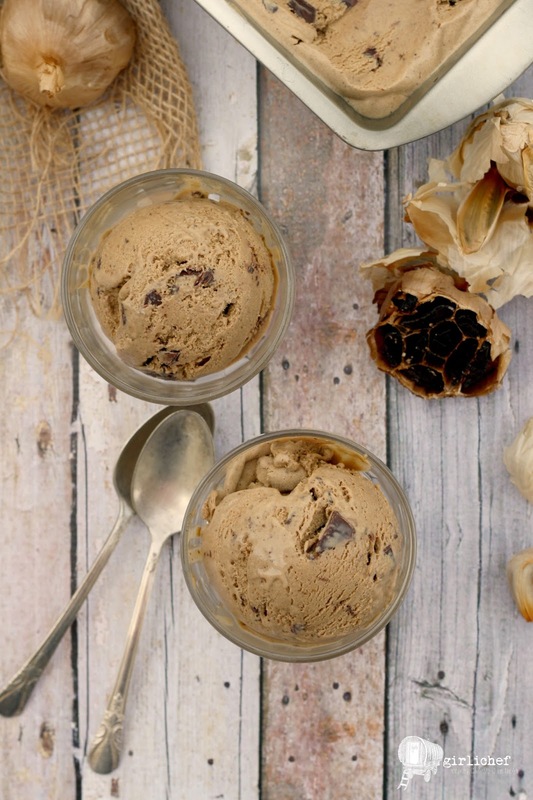 Originally I planned on making a Roasted Garlic Ice Cream. I've seen a few varieties floating around here and there. My copy of The Stinking Rose Restaurant Cookbook has had a sticky note on that page for so many years that it can't be called a "sticky" note any more. But then I had a brilliant idea. 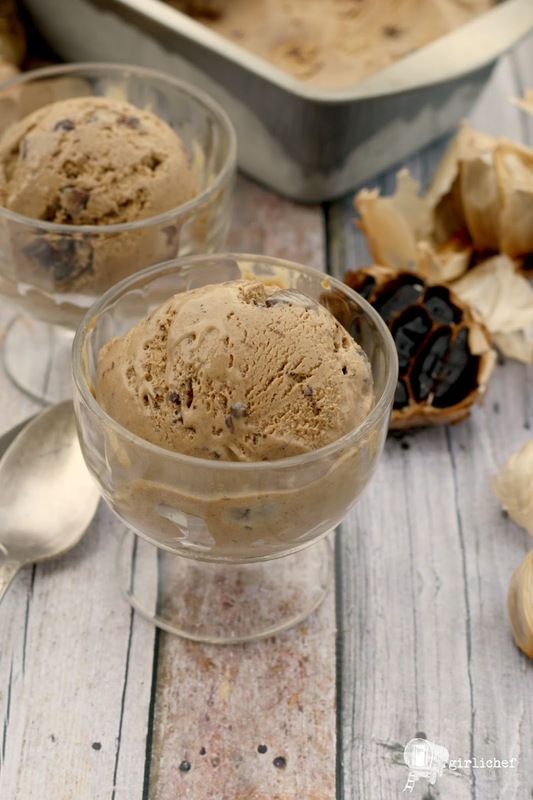 I wanted to use black garlic to make ice cream. I mean, it's totally due to the fact that I just bought a big ol' 1-1/2 pound bag of it, but still. I couldn't get it out of my head. Take a look. Looks like chocolate ice cream, right? That color is all from the garlic. I did decide to add chunks of dark chocolate to it, but those are folded in at the last minute of churning, so they had nothing to do with that deceptive chocolate hue. Go ahead, fool your friends. But do it after a garlic-laden meal so that they think the smell wafting up to their nose is left over from dinner. I'm sure you're wondering if you can actually taste the garlic? Ummmmm, heck YES you can. It is not for the faint of heart. 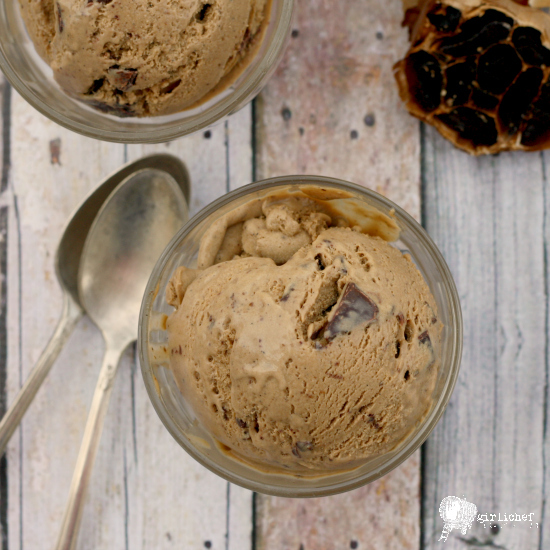 It's sweet and pungent with the taste of honey lacing the frozen custard. But somehow, it's nice. Unexpected, but nice. In small doses (I won't lie). I'd definitely save it for a garlic-themed dinner, National Garlic Day, or even (sssshhhh, don't revoke my garlic-lovers card) April Fools' Day! I'll admit to feeling pretty cool about the fact that I have actually made garlic ice cream now. But I won't be entirely satisfied until I've made a roasted garlic version. 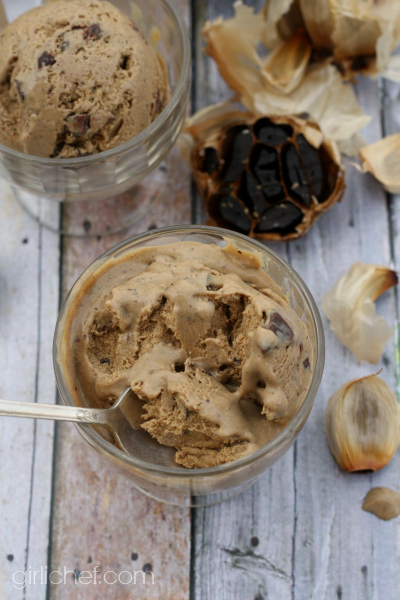 Black Garlic Chocolate Chunk Ice Cream is perfect for garlic-lovers. Eat a bowl to celebrate National Garlic Day! Line a large container with a thick gallon-sized zippered baggie. Set a medium-mesh strainer over it; set aside. Have a large bowl of ice on the counter, ready for adding water. Combine milk, cream, honey, 1-1/2 tablespoons of the sugar, and the garlic in a medium, heavy-bottomed saucepot. Split the vanilla beans in half lengthwise, then scrape out the seeds and add both the seeds and pods to the pot. Set over medium-high heat and bring to a boil, stirring often. Let foil for 30 seconds or so, then turn off heat and keep warm. Combine egg yolks with remaining 1/4 cup sugar in a large bowl and beat until thick and pale, 2-3 minutes. Very gradually beat in the hot milk mixture, dribbling in a very little bit at a time, until it is all added. Be sure to never stop beating, as you don't want the eggs to curdle. I use a hand-mixer to keep everything going quickly, but a whisk and some muscle will work just fine, too. Pour mixture back into the pot. 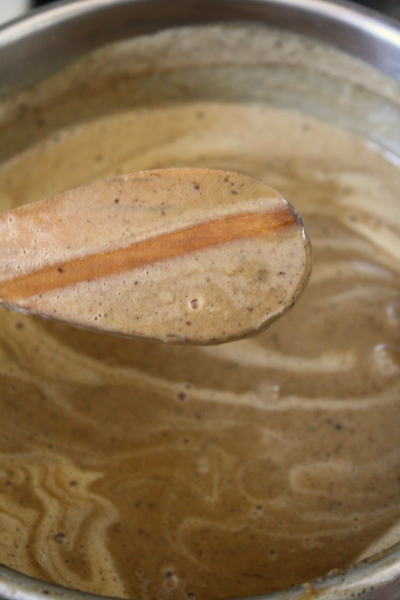 Turn heat to medium-low, and stir the mixture constantly until it is thick enough to coat the back of a spoon (napé). Pour the thickened custard through the strainer and into the baggie that set up earlier. The strainer will hold back any large masses of garlic (don't worry, the flavor is already infused) and the vanilla bean pods (if you haven't already taken them out). Carefully zip the baggie shut, removing excess air. 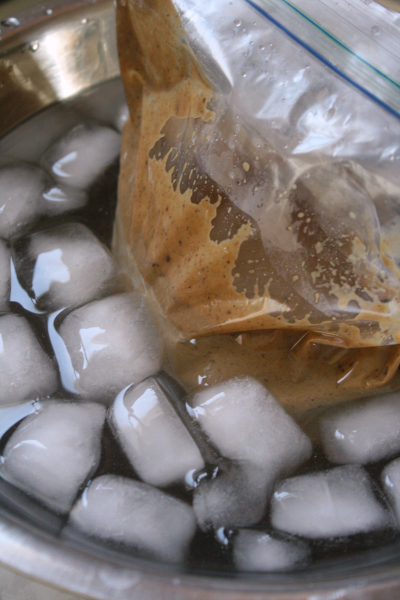 Fill that bowl of ice about 2/3 of the way with cold water, then set the baggie in it (leaving the top, zippered part sticking out). Squish the mixture around to help it cool down quickly. You can let it sit in the water and come back every once in a while to move it around again. It should be cold after 30 minutes. Transfer the cold custard to your ice cream maker and process according to manufacturer's instructions. 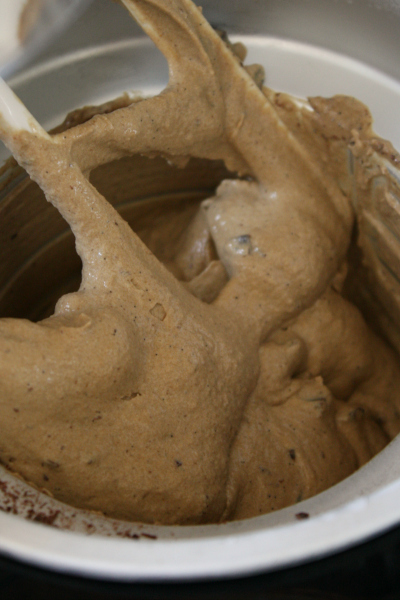 When you hear the machine just starting to stop, add the chunks of chocolate to combine. When it's done churning, it should be the consistency of soft serve. You can eat it like this, or you can transfer it to a freezer-safe container and let freeze until firm, 2 hours or so. 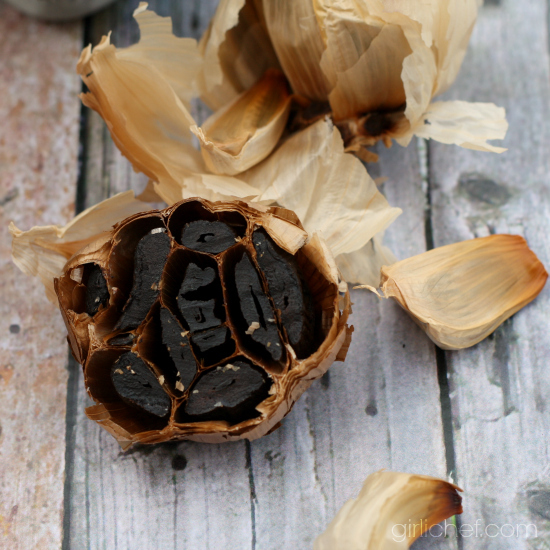 You may also want to try using smashed roasted garlic cloves (increase amount to 2 tablespoons). This will produce a vanilla-looking ice cream with a somewhat mellower garlic flavor. Make with or without chocolate chunks. Toasted, chopped almonds would also be a tasty addition to either variety. So, to celebrate my love for all-things-garlic on National Garlic Day 2014, I asked a few friends to join me. Check out this list of gloriously garlicky recipes that they are sharing today! When you're done, be sure to scroll down and enter for your chance to win some awesome prizes...vampires need not apply.